W is back with part 2 of their FOUNDATION series! 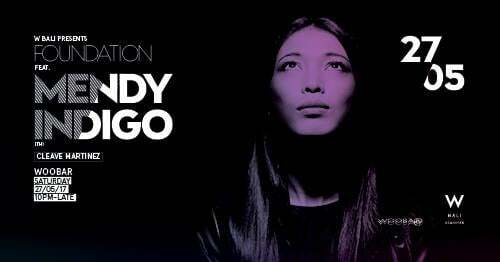 Mendy Indigo is one of Bangkok's leading female underground DJs. One journey to Nepal changed her life – she discovered her passion for electronic music and ever since then she is on the mission to expose her sound to Techno lovers all over the world. She started as part of the Loco Crew in her hometown Korat and continued crafting her mixing skills at the famous Ting Tong bar in Koh Chang. Since Bangkok became her home, she's been known in the scene for her distinctive sound of Techno. Over the years she’s been performing all over Asia until her dream came true and she toured in Germany, including clubs such as the unique Techno Club Sisyphos in Berlin. Today she is hosting events across Bangkok's clubbing scene including her monthly DARK & DIRTY event at Glow, Bangkok's hottest underground club. She's also a resident DJ at Bangkok's latest up and coming club, Beam. In Kuala Lumpur she is now hosting her monthly Girls Got Groove editions in The Sweatbox/Elysium, where she is making her picks of female artists from all over the world.